Government ended years of indifference to victims’ plight with tough law in 2012, but enforcement is lacking, HRW says. Phnom Penh, Cambodia – On a March evening in 2017, Sorn Chanty was returning home from beauty school in Cambodia‘s capital, Phnom Penh, when a man ran at her, grabbed her bag and threw acid in her face. When an ambulance eventually arrived, the crew told the 24-year-old, who was screaming, to get inside but refused to drive her to the hospital or perform first-aid procedures. Once her ex-boyfriend came to the scene, the crew agreed to take her to hospital but Chanty said when they got there, the driver refused to let her out of the vehicle until her former partner had paid $30. They then had to pay another $25 to be allowed inside the emergency room, and an extra $60 on treatment before a labour union stepped in and funded the rest. Chanty is one of 17 Cambodian survivors of acid violence featured in a report released on Tuesday by the Human Rights Watch (HRW) accusing the country’s government of failing to enforce legislation it passed seven years ago that requires legal and medical support to victims of such attacks. The 48-page study, What Hell Feels Like – Acid Violence in Cambodia, said while the number of attacks had sharply dropped, not one acid-attack victim interviewed had received free treatment – as enshrined in 2012’s Acid Law. “Instead, survivors face the full range of problems anyone in need of emergency and other serious medical treatment faces in Cambodia, including denial of treatment until they show proof that they can pay or provide out-of-pocket payments,” HRW said. Health Ministry Ly Sovann told Al Jazeera in a message that the government offered “free services to acid attack victims from public hospitals” but did not respond when asked as to why survivors claimed they had been forced to pay for treatment. Cheap and easily available, acid has been used in deliberate attacks in nearly every part of the world, leaving victims scarred for life physically and emotionally. Cambodia is among the countries with a troubling history of acid violence, experiencing a sharp increase in reported cases in 2000. The Cambodian government finally took steps to curb the problem with the passing of the Acid Law, imposing tougher sentences on those found guilty of such crimes and making it easier – and cheaper – for survivors to get treatment. But even though the legislation led to a fall in the number of attacks – at least 25 have been reported since the law came into effect compared with 36 in 2010 – few cases have made it to court and fewer still to a conviction. Even those found guilty have rarely served out their sentence. “While the Cambodian government has passed legislation to curb the availability of acid used in such attacks and to provide accessible healthcare and legal support to victims … perpetrators rarely go to prison and victims rarely receive adequate healthcare or meaningful compensation,” HRW said. One evening two years ago, after yet another beating from her drunken husband, 41-year-old Phun Sreang picked up a bottle of acid and poured it over his face as he slept. “At that time, I was so angry with him because he had beaten me so many times after he had been drinking,” Sreang told Al Jazeera from her home in Cambodia’s Tbong Khmum province. The couple had been married for 20 years. The liquid immediately started eating into the skin around the face and body of Sreang’s husband, 54-year-old Roem Til. Despite being rushed to hospital, he lost all the sight in his left eye and some in his right. Sreang was arrested, but swiftly released because her husband did not want to see her prosecuted. Now, Sreang is her husband’s carer. Acid still remains relatively easy to buy despite the regulations on the production and sale of the liquids that were introduced in the legislation. 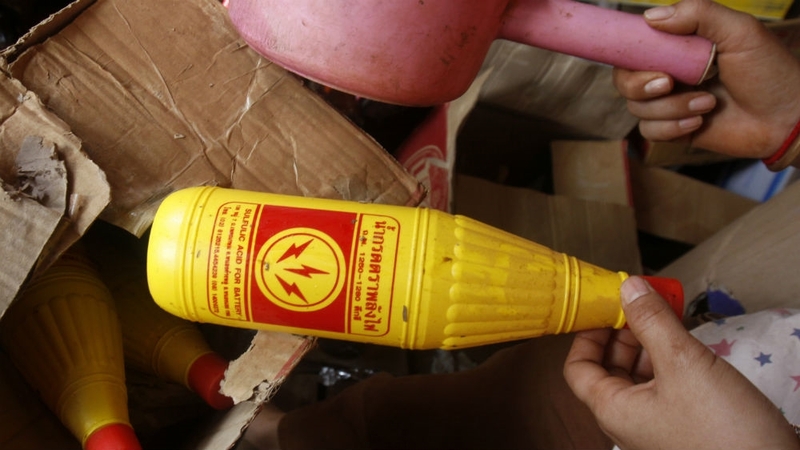 It took Al Jazeera only an hour to find a goldsmith tool supplier who was willing to sell acid – four litres for $5 – even though the law requires that all purchasers of acid must present an “identification card and/or license authorisation stating the professional occupation relevant to the usage of strong acid”. The situation has been made worse by the end of civil society support for the victims of acid attacks. Funding for the Cambodian Acid Survivors Charity (CASC) was reduced, and the organisation shut down entirely in 2015. Erin Bourgois, who spent two years as CASC’s project manager before it folded, said the organisation’s goal, like any non-profit, was to put itself out of business. “It was an emotional time and hard to see the impact it had on survivors as we phased out these services,” Bourgois told Al Jazeera. “We were hopeful that the [government] would fulfil its promise in enforcing and implementing the law to further reduce acid attacks and assume the responsibility of providing support to survivors,” she said. While the Acid Law had been “pivotal” in reducing acid attacks and violence, she said the government now needed to deliver. “Without proper implementation, acid attacks will continue and survivors will not receive the critical support services needed to heal and achieve justice,” she added. Back in Tbong Khmum, Sreang, a cassava farmer, says she would welcome more support as her husband is almost immobile and cannot work. Sreang said she will always harbour deep regret for her actions that day. This story was reported with a Cambodian journalist who requested their name not be used due to fears it could jeopardise their current job.